Is Spirit Communion a Sin? Is Spirit Communion a Sin? is a letter written by Arthur Conan Doyle first published in Light on 9 august 1919. Criticisms on the Bishop of London's Address. "It is a sin to seek to know what we should not know," the Bishop had said. "I can conceive nothing that is more vital." replies Sir Arthur, "and no better work than to bring solace and hope to grief-stricken people." 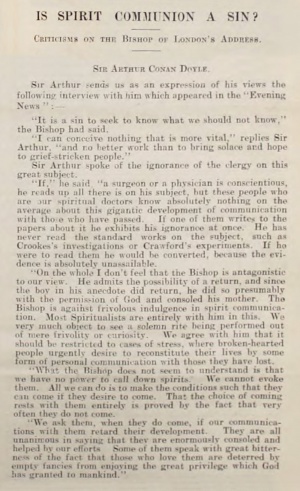 Sir Arthur spoke of the ignorance of the clergy on this great subject. "If," he said, "a surgeon or a physician is conscientious, he reads up all there is on his subject, but these people who are our spiritual doctors know absolutely nothing on the average about this gigantic development of communication with those who have passed. If one of them writes to the papers about it he exhibits his ignorance at once. He has never read the standard works on the subject, such as Crookes's investigations or Crawford's experiments. If he were to read them he would he converted, because the evidence is absolutely unassailable. "On the whole I don't feel that the Bishop is antagonistic to our view. He admits the possibility of a return, and since the boy in his anecdote did return, he did so presumably with the permission of God and consoled his mother. The Bishop is against frivolous indulgence in spirit communication. Most Spiritualists are entirely with him in this. We very much object to see a solemn rite being performed out of mere frivolity or curiosity. We agree with him that it should be restricted to cases of stress, where broken-hearted people urgently desire to reconstitute their lives by some form of personal communication with those they have lost. "What the Bishop does not seem to understand is that we have no power to call down spirits. We cannot evoke them. All we can do is to make the conditions such that they can come if they desire to come. That the choice of coming rests with them entirely is proved by the fact that very often they do not come. "We ask them, when they do come, if our communications with them retard their development. They are all unanimous in saying that they are enormously consoled and helped by our efforts. Some of them speak with great bitterness of the fact that those who love them are deterred by empty fancies from enjoying the great privilege which God has granted to mankind." This page was last edited on 18 July 2016, at 14:26.